With a fall of 19 percent, 2017 went down in history as the worst year ever for container volumes at the Port of Gothenburg. This was revealed in newly published freight figures for 2017. And yet the total freight volume came in at just over 40 million tonnes, buoyed up by good – and in some cases record-breaking – performances in other sectors. More than 70 percent of Swedish international trade distribution takes place by sea. In general, trade with countries outside Europe relies on container vessels. At the Port of Gothenburg, the largest port in Scandinavia, 644,000 containers (20-foot units) were handled during 2017, a fall of 19 per cent on 2016. “This is a downturn that we have never been close to at any point in the history of the port, and it took place in a year when container trade globally had increased. It is difficult to put into words the seriousness of the situation,” said Magnus Kårestedt, Port of Gothenburg chief executive. The long-running labour dispute between the Swedish Dockworkers’ Union and the terminal operator APM Terminals Gothenburg had impacted in part on volumes for 2016, although the repercussions were greatest in 2017. Despite low container volumes, overall volumes at the Port of Gothenburg remained on a par with 2016. 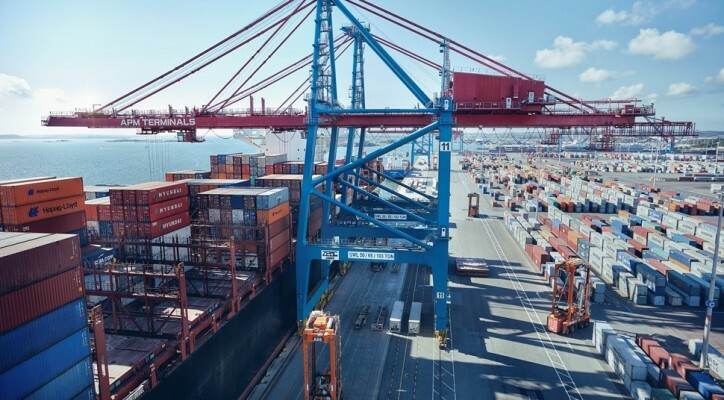 “This can be attributed largely to the record number of cars that have been shipped via the port, coupled with solid figures at our ro-ro terminals*,” said Magnus Kårestedt. During 2017, 295,000 new cars passed through the port – a rise of 20 percent compared with the previous year, and the highest figure since the financial crisis of 2008. This upturn also makes the Port of Gothenburg the largest vehicle handling port in Sweden. A strong underlying factor is the continued export success of Volvo Cars. Ro-ro freight rose for the third year in succession. 593,000 ro-ro units were transported – up 10 percent on 2016. Some 24 million tonnes of oil and energy products were handled during 2017, a fall of one percent compared with the record-breaking year of 2016. If it were not for a planned maintenance stoppage at one of the port’s refineries, the all-time high noted in 2016 would have been surpassed.